The Coast Guard has recertified the Council as meeting its responsibilities under the Oil Pollution Act of 1990. In a February 28 letter to the Council, Rear Admiral Michael McAllister, commander of the Coast Guard’s District 17 in Juneau, notified the Council of the recertification. The 1990 Act requires the Council to reapply yearly for the Coast Guard’s approval as the official citizens’ advisory group to the oil industry in Prince William Sound. Guidelines established in 2002 streamlined the recertification process for two out of three years, with every third year requiring stricter procedures. The Council underwent the streamlined version this year. The comprehensive process, which includes a public comment period, will be required again in 2020. The new recertification expires in March 1, 2019. The U.S. Coast Guard has recertified the Council as meeting its responsibilities under the Oil Pollution Act of 1990. In a February 17 letter to the Council, Rear Admiral Michael McAllister, commander of the Coast Guard’s District 17 in Juneau, notified the Council of the recertification. The Alaska Regional Response Team, made up of state and federal agencies, recently proposed changes to the Alaska Federal/State Preparedness Plan for Response to Oil & Hazardous Substance Discharges/Releases, also known as the “Unified Plan,” which guides oil spill cleanup in Alaska. These changes would replace the Regional Stakeholder Committee, or RSC, the forum that has been used since the Exxon Valdez oil spill to communicate with those stakeholders affected by an incident such as an oil spill. Annual Report 2014-2015. Cover photo by Cathy Hart Photography. The council’s latest annual report is now available! 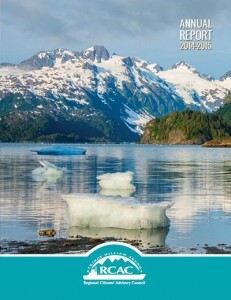 The annual report covers the many programs and projects we’ve been working on over the past year, such as oil spill prevention and response, environmental monitoring, oil spill contingency plans, operations at the Valdez Marine Terminal, invasive species monitoring, our outreach efforts, and much more.